Tomato plot cleared for the winter. This week we cleared a small area of the farm on the side of the house for winter. 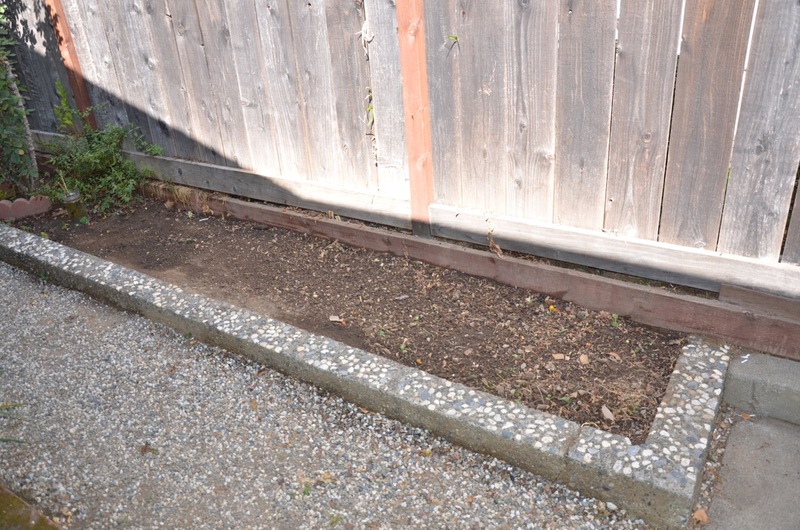 This 20 square foot plot was where we first started successfully growing food on the farm. We pretty much only plant tomatoes there because it’s so warm. This year we had a couple of heirloom plants but it also got overgrown with volunteer cherry and yellow pear tomatoes. The October tomatoes are amazing and fresh. We’ve had a small trace of rain over the past few weeks but it’s otherwise been very warm and perfect for tomatoes. The soil in this area seems to hold up nicely despite the fact that our neighbor has a very large apple tree on the other side of the fence. We grow some roses and mint there too. This year next to that area we also planted sunflowers which were started by Tony Mekisich, the garden teacher at my daughter’s school and planted by Mia. 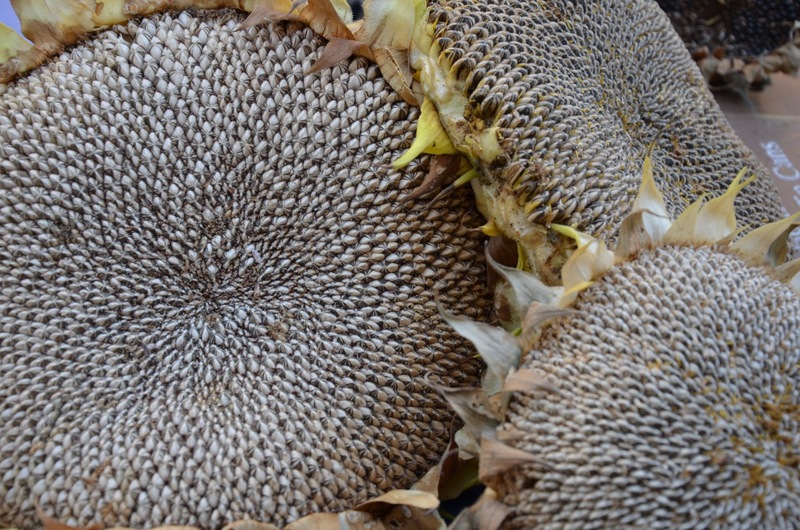 We also harvested the sunflowers which were very prolific. I tasted them too and it’s amazing how good and fresh they are just picked! 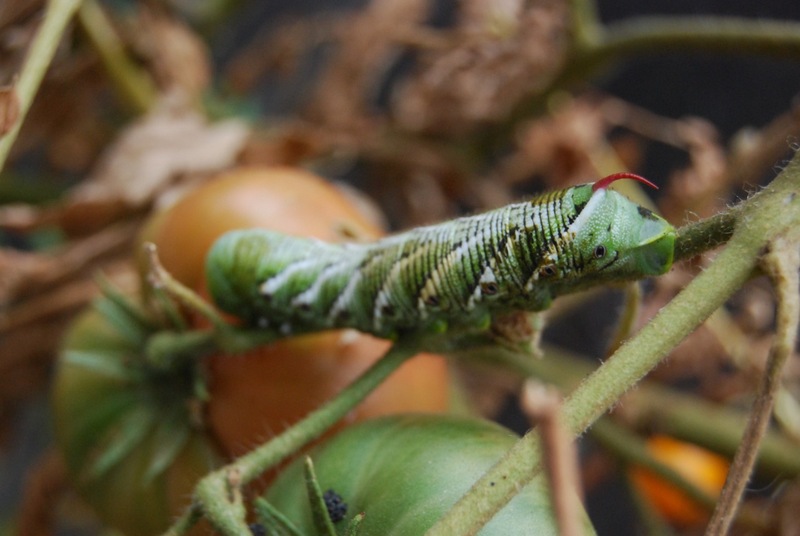 One thing we also found this week was two very large tomato hornworms. It’s amazing how large these little guys get when they have so much food to eat. Thankfully they didn’t take too much of our harvest. I read up on this pest a bit and it seems like we should be able to prevent them in the future with a few simple organic methods. The best method I found was to till the soil in the spring before planting to disturb the pupa. I also a found some products that claim to have naturally occurring bacteria that may also help. One had “Spinosad” in it’s ingredients and the other had “Bacillus Thuricide.” I’ll be looking into this a little more closely for next year. This entry was posted in Crops, Farming Education, Food, Fruit, Hornworm, Lakritz Family Farm, Organic, Pests, Plants, Vegetables, Wildlife and tagged Farming, Food, Gardening. Bookmark the permalink. I have really enjoyed following the Lakritz Family Farm this summer. It reminded me of my childhood in the California Central Valley town of Hanford and my father who was an educator at Lakeside Elementary (late 50s and early 60s) and Hanford Union HighSchool (late 60s through 1980). My dad grew up in Iowa on a family farm and was always a very avid gardener when we were growing up. He had more than half of our yard planted in garden and was always on the lookout for a fruit or nut bearing tree that would fit in a corner here or there. This was how he spent his summers when teaching in the Hanford community. I have lived in Wisconsin for 25 years now (except for a recent brief return to CA) and this is where my family make their homes as well. When my daughter purchased her first home late last year there was a 15×15 garden plot tilled behind the garage. We decided to plant it this year as I had some time to be able to tend to it for her. I would like to share with you our adventure in urban gardening from aWisconsin Family urban farm since it is a little different from the California experience. Our âtop soil is naturally very deep due to the glacialaction of the great lakes in past centuries. We live on the western edge of Lake Michigan. So in contrast to the Lakritz’s we didn’t need to condition the soil or fertilize, mother nature took care of that for us a while back. The soil is dark black as deep as I can dig and is really great for growing everything especially weeds. One of my main deterrents to gardening in the past has been the maintenance. I haven’t felt that I had time to keep the garden up and the weeds under control. My dad always said that he had 6 kids to weed the garden and do the dishes.I spent a lot of time on my knees in the garden growing up and hence, I am not a fan of weeding. Since I only had two kids and neither one is big on weeding gardens, I decided to try to use landscaper’s cloth under the mulch for this small garden. It was a really good idea! We really only weeded once the whole summer and then only around the edges. Once we planted we had to deal with the bunnies (wild and prolific in our neighborhood). The first night they mowed down all of the plants with the exception of the squash. The next day, we added chicken wire cages around all of the plants and had no further problems. We started picking a few kale leaves in late July and ourfirst tomatoes and peppers in early August. It has been wonderful to make fresh salsa and salads with this produceand to know where our food is coming from. We would get enough for the week each time we picked with greater and greater produce as the August days got hotter. My daughter shared the harvest with friends and co-workers. 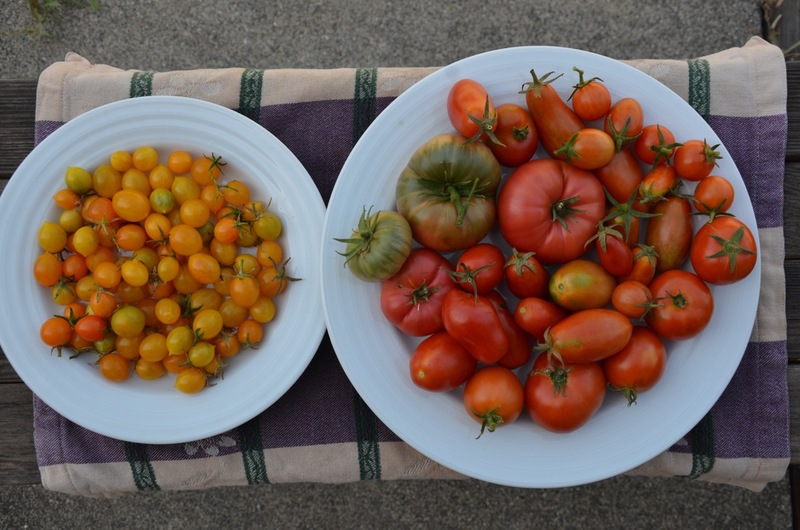 Our tomatoes ripen slowly here since the hot days are only in the upper 80’s but, we were blessed with a warm September and all of our plants continued to produce. This is why we chose to plant smaller varieties of tomato (cherry and plum). In some years past the bigger tomato varieties have never ripened fully. The butternut squash went pretty crazy, as squash are known to do. It filled the entire space allotted to it and started climbing the chicken wire for the kale. We have picked 6 beautiful squashes already and there are at least 5 more on the vine still ripening in early October. I am discovering a great many recipes for butternut squash and love it in both savory and sweet preparations. Very versatile! Now that it is October, we are expecting frost soon. We will be cleaning up the garden patch this week and harvesting any remaining produce. We need to put the patch to rest for the winter as I don’t know anything that grows in snow. We plan to make a batch of Marinara sauce with the tomatoes basil and rosemary. I will make pickled peppers and hot pepper jelly with the peppers. Squash keeps wonderfully well in a cool basement for use throughout the winter. The kale will be blended with apple juice and frozen into ice cubes to be used in winter morning green smoothies. looking forward to starting the morning remembering the warm days of summer. I can’t wait to plan next year’s garden. Now I understand why my dad found this so rewarding and relaxing. Growing up I thought it was all about sustaining the large family with inexpensive and healthy food. True but, in reality, it was also about nurturing his mind and soul through this wonderfully rewarding activity. I highly recommend it, start small. You will be surprised at how much joy you will get from your own urban farm in addition to the yummy produce.